Price includes a FREE 4-color process imprint on notepad and BIC® Digital WideBody® Color Grip Pen. 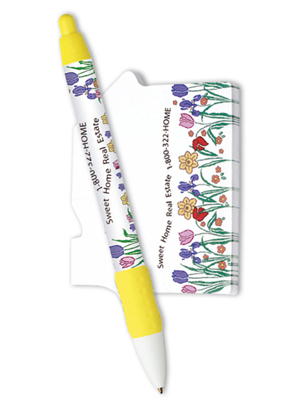 Please see individual product pages for BIC® Sticky Note™ pad and BIC® pen specifications, including imprint areas. Visit www.bicgraphic.com for the complete selection of Stock Design Notepads. Due to different printing processes, the imprint colors on pens and notepads may vary slightly. All Design Packs feature the stock backgrounds as shown - STANDARD! Packaging: All Combo Packs include cello wrap packaging.